What Does a Coast Guard Yeoman Do? Yeomen, familiarly referred to as YNs, are vital components of the Coast Guard’s day-to-day functioning. They work directly with personnel in problem-solving, counseling, and answering questions related to career changes, entitlements, incentive programs, retirement, and veterans’ benefits. When a member of the Coast Guard seeks information or needs assistance, the YN is the go-to person. YNs keep the Coast Guard ticking, helping members advance in their careers and understand their pay, benefits, and Coast Guard policies. A YN's salary can be dependent upon the duration of service and, to some extent, location. You'll additionally have access to a Thrift Savings Plan, which is a retirement and savings program plan similar to a 401(k). You'll have superior health insurance coverage, life insurance, and long-term care insurance. As a full-time government employee, a YN is eligible for exceptional benefits. You'll earn 13 days of annual leave every year for your first three years, 20 days of leave for three to 14 years of service, and 26 days for more than 15 years of service. You'll also get 13 days of sick leave. The Armed Services Vocational Aptitude Battery (ASVAB) Score: The required score for a YN is VE + AR = 105. Listen, take your time, and don't be afraid to ask if you have a question when you're taking the ASVAB. The test is taken on a computer, and you can only use a few keys to answer questions. If you press an invalid key, your test might be invalid and you’ll have to come back and take it on another day. The most important thing to remember is to read and listen to instructions carefully. Class A School: YN hopefuls can attend a Class A school in Petaluma, California, or enroll in a distance-learning course. The on-site class lasts eight weeks. Keep in mind that there are only a few slots available for the online course. You can also “strike” the rating from your initial duty station without attending Class A school to attain the rank of Third Class Petty Officer upon successful completion of the requirements. You can also take advantage of a range of educational advancement and development programs once you become a YN. As a practical matter, the armed services are not likely to go anywhere. Careers in any branch of the military should be available for a long time to come. 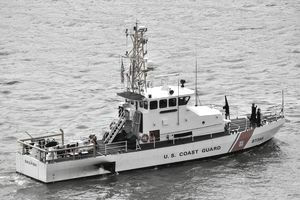 A YN can serve anywhere the Coast Guard operates: in a small office or aboard a Coast Guard vessel. Onboard jobs are very rare, however. The majority of YN positions are land-based. Most Coast Guard units that employ YNs are located in or near large metropolitan areas, although opportunities are available at smaller offices. A survey by Indeed.com indicates that this position ranks four out of five stars for work/life balance. Of course, this can depend a great deal upon whether the YN is land-based or onboard. This isn't to say that you should expect a 9-to-5 job. The U.S. Coast Guard Forum indicates that hours are generally either 7 a.m. to 3 p.m., or 8 a.m. to 4 p.m. on land, and that there might occasionally be some overnight duty during times of pressing urgency.